provoked by The documentation. It forces the audience to comment. What You have thought and done, then, at the beginning of September 2015, as German Chancellor Angela Merkel decided to open the German borders for thousands, hundreds of thousands, more than a Million mostly Syrian refugees? What images are still there, the memory of the facts or has sampled the setting to the theme, in the meantime, an own individual movie? Such questions, including all possible feel amplitudes whizzing by the head, and not just for the Moment, but about five times 50 minutes. So long peoples, will take a "hike", the documentary series in five Parts, the have compiled the best Team of Stefan Aust and Helmar Büchel for the mirror story. The program Director Michael Kloft said at the press screening in Berlin, the 4. September 2015 is the most important day in the recent history of Germany. Including makes it the ambitious project, which tells of three years from the autumn of 2015 until December 2018. The authors wanted to have changed, Stefan Aust, a log, a chronological narration reported how Germany and Europe as a consequence of the migration of the peoples – and to still be changing. For the phenomenon of Migration there is in this, as in the perspective of human history, no Beginning and no end: people leave their homeland, came, whenever, wherever, for whatever reason: war, economic despair, political hopelessness. Something Better than death you can't find anywhere, truly a city of musicians motto. The first part lays the Foundation by motives and dilemmas are shown to the millions of people who have fled the war in Syria, the Islamic state in the Middle East and often for years in refugee camps in Lebanon, Jordan and Turkey, to endure. These people make their way to the open gates of Europe. Yesterday, today, tomorrow: Quasi in the final image of people sitting on the six-Meter-high, pointed-toothed fences, to protect the Spanish enclave of Ceuta on Morocco coast in front of the Non-welcome from Africa. You will take the obstacle to the assumed promised Land, that is as EU. The borders are open, is the final word. "migration of peoples" look there and there and interested in the common core for the anthropology of the domestic, for the Germans and the refugees. From euphoria to disenchantment, of Merkel's optimism "We can do" to the populist scream of rage, "We hate this". Part three is exemplary, and if the 28. October 2015, for example, the autumn will be taken for the Refugee, as the open Balkan route is the motorway to Germany, suffering, fear, hope, Overwork mix. Also the Christmas bomber from Berlin, Anis Amri, pulls out his track by the film series. "migration" back to the view, without at the time, Involved and Responsible look back. There are no Interviews to the question of whether, at the time, otherwise would have had to be traded. The documentation lives in and from the Moment of the action, of what Happened. The Material of the mirror TV and N-24 breathes the style of the earlier mirror-TV-editor-in-chief Stefan Aust: movement remains only in front of the camera, never by the camera, the Reporter is necessarily invisible. This has to be something Immediate, justified by the authenticity, the diameter of the neck for the neckline. The progressive time structures the rhythm, displayed data and maps provide orientation. Stefan Aust speaks from the Off, sometimes his posts to comments, don't be afraid of the sarcasm and criticism of the Chancellor. Apparently Stefan Aust has known already then, what some still today, do not want to know. 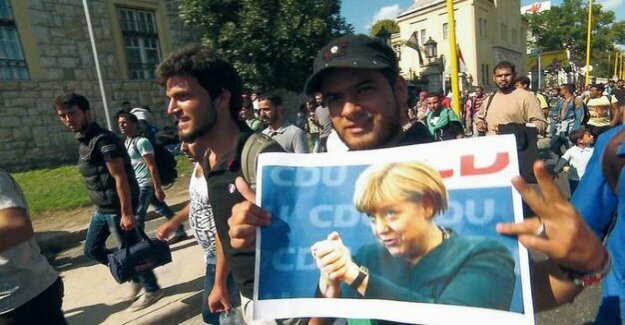 "Mommy Merkel", as the refugees, to praise the Chancellor, will be Aust's girlfriend. Should be so, because the film Aust-makers and Büchel, have created something Remarkable. Their compilation, it can contribute to the Narrative is essential to the workup of the mass Migration to Germany in the reality and into the consciousness of the Germans in begins. "Migration" is a first step and a second.